My second love (the first one - big sculptures!). Why? In short - because it is in your sight 100% of time! If you pay money for decoration, it has to "work". So if you paid for a vase with beautiful (and expensive) flower arrangement, but someone is standing between you and the vase and you do not see it - what did you pay for? It might as well not be there at all. But ceiling is always in your sight. So what you have purchased works all the time. Second consideration is this: ceiling is a big part of what you see. You might not really looking at it - there is nothing to look at!, but it is big part of the background. Usually it is white and flat. Sometimes it has chandeliers and may be something else. If we add color of the party and some texture to this plane surface, the room becomes a much better space for the party. Most humans like reflective mirror-like surfaces. Just think of a hall of a five star hotel or a fancy casino. Gold, mirrors, glass - all shiny and spotless. It works because it reflects light. What is the next best (and least expensive!) thing that does it? Correct - balloons, especially metallic ones. So, if we change the dull surface of the ceiling to some kind of a balloon display - we make feast to the eye! The last point to mention - helium filled balloons can lift ribbons (air filled balloons that hangs down, anything that is decorative and liftable). With air conditioning and in general - with people moving in the room, the ribbons move too. That is a lot more interesting to the eye than the motionless decoration. Especially if part of the ribbons hanging down is mylar and reflect light. With all of that in mind, let us take a look at different ways to decorate the ceiling. I made a list of them - 10 different things, to amaze myself! 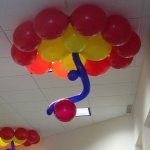 It is relatively new balloon design, because it uses link-o-loons, balloons with two tails. One of the best inventions in the balloon industry. Link-o-loons were invented in the 90's. 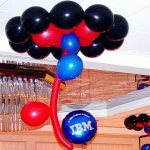 Such a simple addition as the second tail on the balloon gave rise to amazing number of designs we did not even think about! On of them is Balloon Corall. In the simplest form, it is just a ring of link-o-loons, filled with helium and lying on the ceiling. The inside of this ring can be filled with balloons on the ribbons, smaller rings of link-o-loons with some kind of a center, as well as infinite amount of beautification in form of hanging ribbons, stars, long balloons and so on. Picture 1. Double Tree hotel, employee appreciation day. The concentric circles of two contrasting colors, their corporate colors in this case. 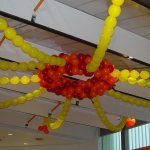 The cluster in the center is decorated with long balloon hanging down. Pict 2. Smaller version of the same idea. .Pict 3. Same design with the twist - company logo. Pict 4. Here it is! Balloon corall design pushed to the limits! Heavily beautified balloon corall for a baby shower. Concentric circles in the party colors with "golden frame" created out of big gold crescent moons and ribbons. Notice that all balloons except moons are helium filled, moons are air filled in order to hang down. They are kept on the ceiling with black and white helium balloons. 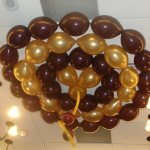 Even though personally I love big sculptures, my taste is "pure and simple" or even minimalistic, which is strange for a balloon decorator (we are understood to push as many balloons as possible!). 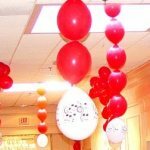 The reason for it is very simple: it is very easy to overload a room with balloons. The result is horrible. 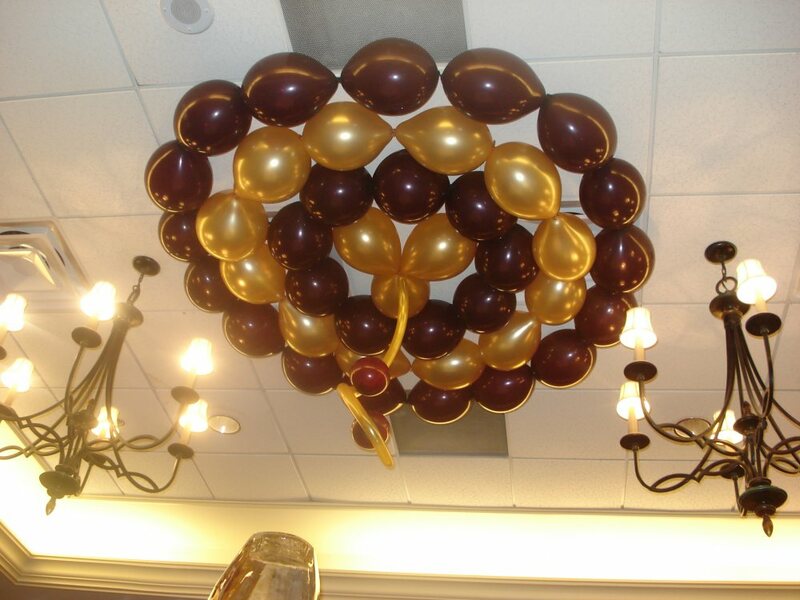 From that point of view, the ceiling clusters is one of the best balloon decoration. -It is very simple, does exactly what it has to do: brings color and reflective surface on the ceiling, and allows to hang the ribbon (or some other light material). -In a lot of rooms the ceiling is too tall to decorate and, if you want to put even something simple, you need a ladder tall enough of a lift. Even if it is available, it takes a lot of time to move it around the room. If it is not, even the rent of the ladder can significantly increase the cost. 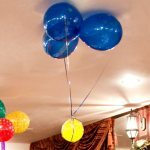 With ceiling clusters it is practically trouble free: attach the ribbon (or what to hang from the ceiling) to the helium filled balloon cluster and let it go! -The last advantage is the price. Even though we are out of helium on this planet, while we have it filling 3 balloons can cost only so much. 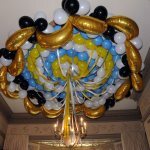 So even most balloon decorations have fixed price (balloon arch, sculpture,...), dressing up ceiling with the ceiling clusters is very flexible: you can use 10 of them, 25 or 17 and a half... (sorry! halfs are not available today!). One word of warning: the larger the room the more ceiling clusters it takes to make the room look good. If, for some reason, there is no way to place enough of them on the ceiling, it is better to have none. Very few look terrible. Picture 5. Wedding decorations. Ceiling is very high and unreachable. But with ceiling clusters problem is solved. The main part of the decorations though is the ribbons hanging down, even though it is not obvious. As I stated earlier, moving decorations do more than motinoless. Picture 7 Variation on the subject. Short balloon garland instead of the ribbons. The theme of the event was music, so the white balloon is has musical note prints on it. One more way to add to the theme. A lot of rooms have drop down ceilings, which gives us opportunity to hook up to the metal frame anywhere. Than it is easy to hook up to the ceiling almost anywhere, tying to the frame of using the click magnets. That gives us unlimited opportunities for balloon or non - balloon decorations: swags, flags, nets with fish (say, for the underwater party) and so on. 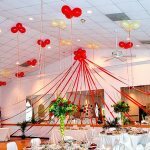 Also that allows us to stretch a ribbon or a balloon garland from point to point. 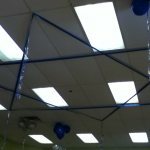 So we can draw a star or Magen David on the ceiling. On one occasion we have drawn a crisscross game up there!. Again, the limit is the sky. Unfortunately, this is the only photo I have - Picture 8. Not a very good one, but illustrates the idea. 4. Let us call this type - sun. Picture 9. Looks perfect. The limitation here - the ceiling must be reachable and easy to attach to (just like in the previous example - drop down ceiling is ideal). This type of decoration also belongs to the room shaping sculpture category - once we have the sun up on the ceiling, the room is minimally dressed even if we have no other no other decorations. Pict 10. Again, variation on the theme. 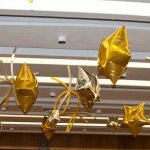 If there is a way to attach ribbon to the ceiling, we can make a sky full of stars! Notice, that the stars are air filled, so that they hang down rather than sit flat on the ceiling. Even if the ceiling is flat painted surface and there is no way to attach the ribbon, we can lift the air filled star with the ceiling cluster. In this case we have to see how many helium filled balloons we need to lift and keep the star in the air for the duration of the party. This is especially important in case when the room is decorated well in advance. As I warn in every other post, helium escapes through the walls of the balloon and regular (11") balloon can fly for 15 - 18 hours, just caring its own weight. If we use it as lift and expect it to support the mylar star (or any other decoration) for a while, we have to make sure we have enough helium balloons. In the cases when it is crucial it has to be found out by direct experiment.